Exempt Students : Hawks, Toads, Nester, and the Hop-Alongs. This group of students is also known as "THE 6". All students are allowed to have food in c2 during enrichment. Any student given food by the teacher is allowed to eat that food at their station. Food and Drinks are not allowed inside room C2 for most students. It does not have to be open or being consumed. Any visible food or drink is considered a violation even if it not open. The definition of room is slightly different for the food and drink policy. 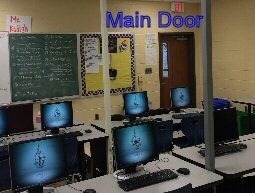 Our classroom has two doors. One door is near the library and is referred to as the library door. The other door is referred to as the main door. One area is NOT considered inside the room for the food and drink policy. This area is called the "square". 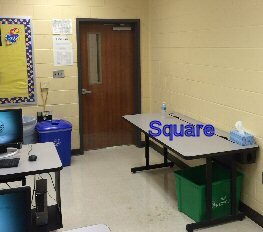 This area will be pointed out in class and includes part of the table by the main door of the classroom. 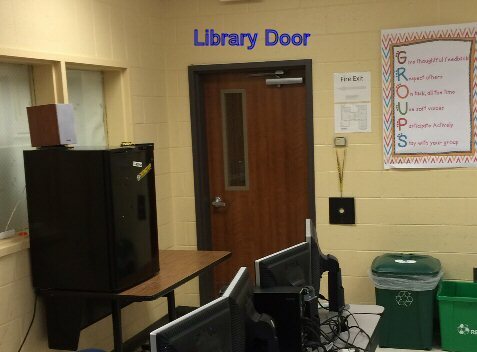 The library door does not have a "square". The "square" can be used to place food and drink without violating this policy. Students may access the food and drink in this location during work time. I will designate work time. Basically if I am interacting with the whole or part of the class - IT IS NOT WORKTIME. Going to the square at inappropriate times will result in violation. Appropriate time for to access the square to eat and drink is during DESIGNATED computer work time. This means if you are working at a computer you may eat and drink at the "square". I will designate work time each day. If I fail to indicate work time, ask. Never go to the "square" while I am talking or within the first 10 minutes of class. Entering the classroom with visible food or drink through the library door and walking to the "Square" is a violation of this policy. Having any food or drink at a computer station will result in a violation of this policy. It does not matter if the food or drink is opened or closed. It is not allowed at the station in any form. 1st violation - The Hawk will submit the Food Drink Violation form at the time of the incident. 2nd and 3rd - The Hawk will submit the Food Drink Violation form. The student will write their name on the front left board. When the name is removed from the board will depend upon the period the student is in. The only person who can erase the name is the student who who has their name on the board. 3rd Period - erase the name off the board during enrichment. 4th Period - Erase after class and stay 5 minutes. 6th and 7th - The name can be erased after school or during enrichment the next day they are in school. 8th - The student can stay 5 minutes or erase the name during enrichment the next day they are in school. 4th and above - The Hawk will submit the Food Drink Violation form and the student will attend Enrichment the next day or first available day. Failure to erase your name off the board by the appropriate time will result in being assigned an Enrichment the next day or first available day. Failure to attend an Enrichment - two Enrichments are assigned. Failure to attend both Enrichments will become an administrative matter with the recommendation of a 1 hour detention with me. 3. Log on the workstation. 5. Go to the schedule. Other choices may be made available instead of consequence listed above. Possible choice may be Hawk bark, quack track crocker, or cleaning up a computer station. Choices depend upon the instructor. Only the hawk, nester, toads, and the hop-along are allowed to eat and drink in the classroom at their workstations..